Stars, who sing perfect Smiths/Belle and Sebastian-style pop songs, performed a live set on NPR‘s Studio 360. The show aired yesterday, and the segment is available for streaming or download. They also did a live bonus version of “Personal”, which is archived below. 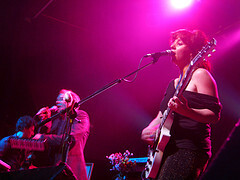 Image: Stars/Phoenix Concert Theatre/November 28, 2007 by Flickr user * Janice, reposted here under its Creative Commons license.